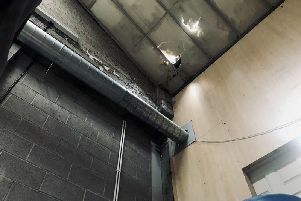 The man who was trapped under a machine at Creagh Concrete’s Ardboe site on Thursday has now been discharged from Craigavon Area Hospital, according to the Southern Trust. It is understood the man got his leg trapped after a machine that is used to lift concrete slabs fell on to it. Paramedics were called to the scene at 8.05am after receiving a report of a man trapped under a machine in Ardboe Business Park. “One A&E Ambulance attended the scene and a male patient was transferred to Craigavon Area Hospital,” said a spokesperson for Northern Ireland Ambulance Service. The incident has also sparked a Health and Safety Executive (HSENI) investigation. Creagh Conrete has been contacted for comment.